Besides being a day when you can dress in all green and pinch people relentlessly, our family loves Saint Patrick Day because of all the great St Patrick Day recipes! And one of our favorite easy St Patrick Day recipes for kids? 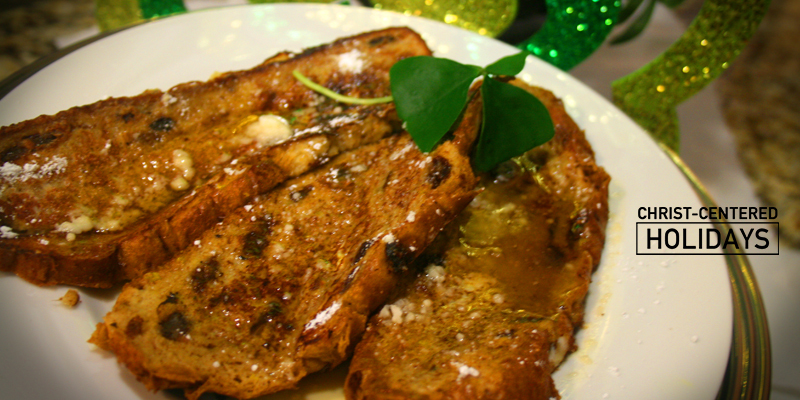 Irish Soda Bread French Toast. This awesome St Patrick Day recipe is always a part of our St Patrick Day activities for kids. It all started a few years back when we had leftover Irish Soda Bread. Surely we couldn’t let this rounded loaf of perfection go to waste! And so we began the tradition of a St Patrick Day breakfast with a delicious and easy St Patrick Day recipe: Irish Soda Bread French Toast. Your family will love this fun St Patrick Day twist on a traditional Irish Soda Bread Recipe! I promise that even the pickiest leprechaun wouldn’t pass this recipe up! And that’s it! Now you’ve got a great new reason to make traditional Irish Soda Bread as part of your St Patrick Day recipes. Enjoy this easy St Patrick Day Irish Soda Bread recipe with your kids! Happy St Pats!